Bad weather can happen at any time, but of course it always seems to happen when you’re out and about. Mobility scooter users know only too well how frustrating it is when the rain pours, the sun shines too brightly or even when snow appears whilst you are making an essential journey. Even when your scooter is parked, you still need to keep your seat dry whilst you are visiting friends or shopping, for example. That’s why an all-weather cover is the best way to protect yourself and your scooter. 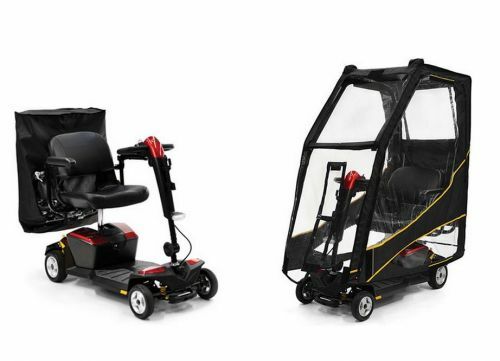 A folding canopy is ideal for when you are out and about on your mobility scooter. The best canopy will fold up and store easily on the back of your scooter, ready for any weather. When most people think about covers, they are thinking about rain, but actually all the elements can be problematic when you are travelling in an uncovered scooter. A good canopy will also protect you from the sun, and will reduce glare, thereby increasing visibility. It will also protect from strong winds, snow, hail, sleet and even from stormy weather. If bad weather occurs when you are on the go, the last thing you need is a fiddly cover. That’s why a fast and easy to erect folding scooter canopy is the best way to escape the weather quickly. The benefits of a folding canopy are that you can fold it back in seconds, when the weather improves, with no need to wait until the end of your journey to put it away. A folding canopy gives you the flexibility to enjoy or avoid whatever weather comes your way, easily and quickly. When your scooter is parked, you’ll still want to protect it from the elements by using a canopy. A folding campy is extremely useful when leaving a scooter parked up outside a shop or a friend’s house too as it’s easy to transport it with you and put up when you park it, just in case the heavens open. At home, it’s best to have a proper covered area such as a carport or garage for long term storage, but a folding canopy will still prevent dust and wind from affecting your scooter. As you can see, a folding scooter canopy has many benefits for use during sudden bad weather situations. Not only will it protect from a wide range of weather conditions, such as rain and wind, but it can also be erected quickly and put down fast should you change your mind. Bad weather can happen at any time, so instant protection is ideal for those who want to look after themselves and their scooter too. Is The Chosen Residence In Khargar Ideal For You?